The Palacio de Ferias y Congresos in Marbella will be hosting a jazzband and symphony orchestra concert on Saturday October 16 at 8:00pm. 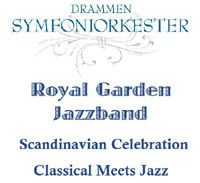 The Drammen Symphony Orchestra and the Royal Garden Jazzband will perform a fusion of classical music with jazz that will appeal to all music lovers alike. The Drammen Symphony Orchestra is located 40km from Oslo and was founded in 1919. The Royal Garden Jazzband is a Norwegian group founded in 1955 and thus is a very experienced band with a well known following. The repertoire will include interpretations of well known classical music pieces, Scandinavian songs, and successful musical pieces from all generations with a special selection of classical jazz. Tickets may be purchased at the box office of the Palacio de Congresos in Marbella from 8:00am to 3:00pm. The Palacio de Congresos is located on Calle José Meliá, 2 just off of Avenida Principe Alfonso von Hohenlohe near the "piruli".